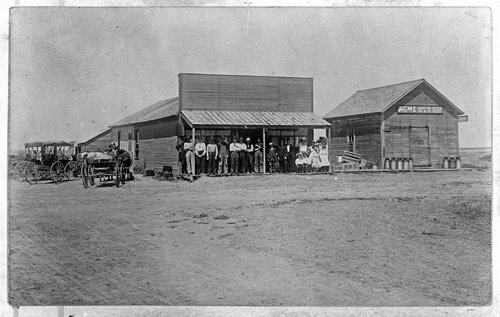 This photograph shows an unidentified country store and a creamery in Sheridan County. People are standing under the storefront overhang. The sign for Acme Creamery is on the building next door where milk cans are setting out front. There are several horse-drawn buggies sitting along side the store. No trees or other structures are seen in this photo.